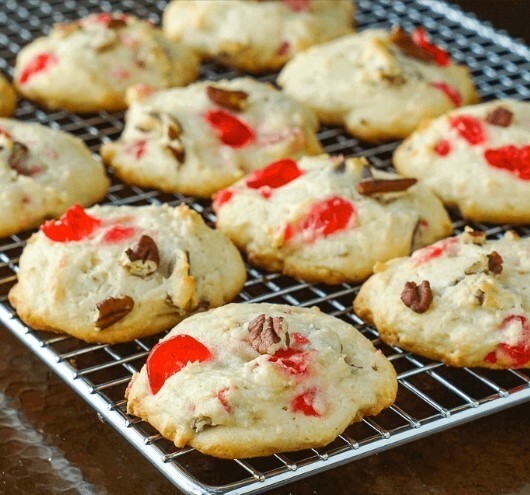 Cream Cheese Cookies with Cherries and Pecans. An easy to make drop cookie that takes its inspiration from an old family recipe for a favourite pound cake. 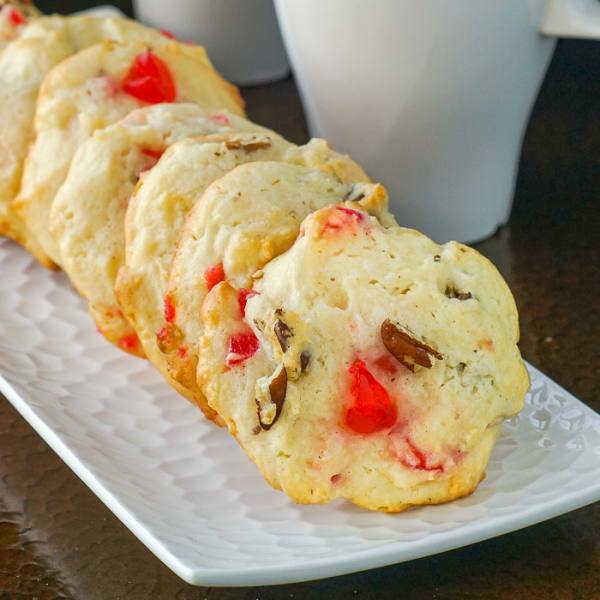 The inspiration for the flavours in these cream cheese cookies came from a recipe for Cherry Pecan Cake. The recipe has been in my extended family for many, many years and was first passed on by friends in Badger, Newfoundland. 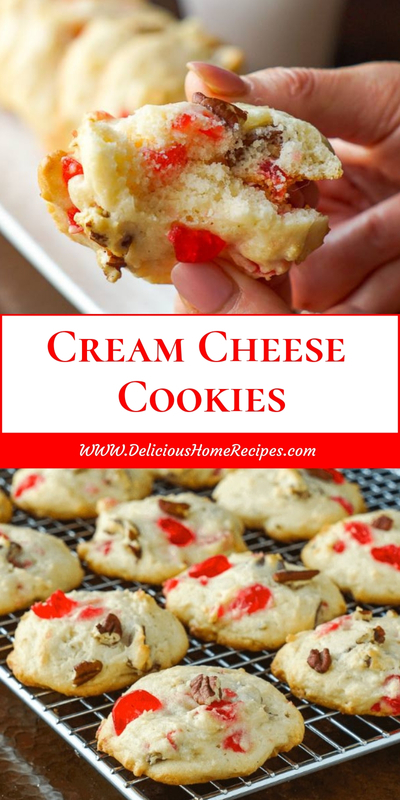 These soft, rich cream cheese cookies turned out beautifully. The crunchy pecans and sweet cherries were the perfect flavour accompaniments. I think I’ll be experimenting more with additions to this base recipe soon. I already have a few ideas in mind! Preheat oven to 350 degrees F. Line 2 or 3 cookie sheets with parchment paper. First toast the pecans so that they can cool. Toast them on a cookie sheet in a single layer for about 7 to 10 minutes tossing once halfway through that time. Let them cool to room temperature and then roughly chop them with a knife, or snap them into small pieces with your fingers. I like to keep the pieces sort of chunky for best crunchy texture in these soft cookies. In the bowl of an electric mixer, cream together the cream cheese, butter and sugar until soft and fluffy. Fold in the dry ingredients until a soft dough begins to form. When almost all of the flour has been incorporated, add the cherries and pecans and fold in well to distribute them evenly throughout the dough. Drop the dough by rounded teaspoonfuls onto the parchment lined cookie sheet about 3 inches apart. Bake for about 15 minutes until the bottom edges become golden brown. Cool on the cookie sheet for 10 minutes or so before transferring the cookies to a wire rack to cool completely. Store in an airtight container. These cookies are quite freezer-friendly.